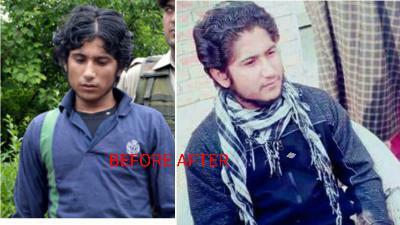 Srinagar: The National Investigation Agency (NIA) probing the prison escape of militant Naveed Jatt has found that Naveed used large supplies of a smuggled skin fairness cream in Central Jail which played a crucial role in this escape. The investigators turned their focus to Fair & Lovely smuggling into jail, after going through all available pictures of Naveed — particularly before and after jail. “We were shocked to find the drastic difference in skin tone towards a fairer side Naveed had achieved while in jail. It isn’t possible unless you are rubbing large amounts of Fair & Lovely three to four times in a day,” an NIA official told Dapaan. He said that the fairness cream played a crucial role in his jail escape, as he easily got mingled with fairer skinned Kashmiris, which was not possible earlier. “We are sure it was all part of plan. Had he been of darker complexion when he escaped, locals would have mistaken him for a CRPF personnel and never helped him,” he said. NIA Director Aurek Modi told Dapaan that for now the agency is trying to find out if Naveed was using Fair & Lovely or the Fair & Handsome cream, besides investigating the collusion of jail officials into smuggling. “We are investigating how the cream was smuggled into the jail. There seems to be a clear nexus of jail staff,” he said. He added that jail manual bars use of skin creams as they may help prisoners change their disguise. Meanwhile, Fair & Lovely has approached the NIA to let them use the pictures in the advertisement. “We know he is an anti-national element so we will market it in reverse. Instead of using before and after pictures, we will use After and Before pictures. We want to show to people is that if you don’t use Fair and Lovely cream you will become anti-national,” a company official told Dapaan adding they cannot miss the opportunity to augment sales among fairness crazy people.